Two cases against Guddu Pandit was filed at Pinhat police station last week. “In the first case, Guddu Pandit is accused of allegedly using abusive words against former minister and MLA Raja Aridaman Singh, while addressing a public gathering at Pinhat town," said Gyanendra Solanki. 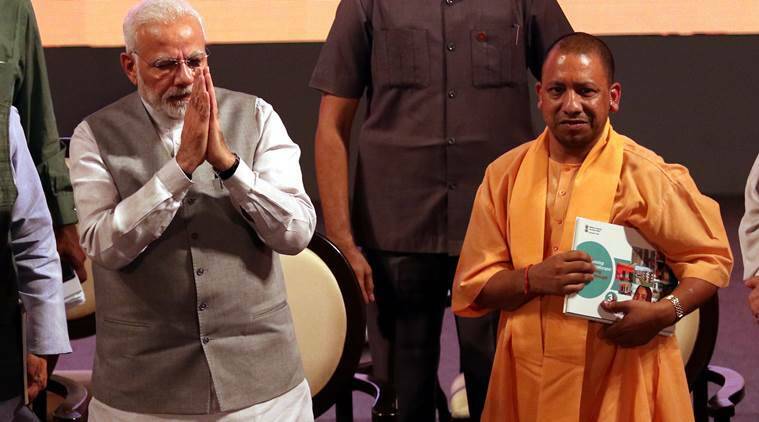 Prime Minister Narendra Modi with Uttar Pradesh Chief Minister Yogi Adityanath. Agra police on Saturday lodged an FIR against SP-BSP alliance candidate Bhagwan Sharma alias Guddu Pandit for allegedly making objectionable remarks against Prime Minister Narendra Modi and Uttar Pradesh Chief Minister Yogi Adityanath during a public meeting in Fatehpur Sikri on April 12. This is the fourth case against Guddu Pandit for violation of poll code in Agra in a week. Other cases were lodged at Sadar and Pinahat police stations. Guddu Pandit is contesting election on BSP ticket from Fatehpur Sikri Lok Sabha seat. Deeksha Sharma, Assistant Superintendent of Police, Agra, said, “The case against Guddu Pandit was filed at Fatehpur Sikri police station for allegedly using foul language against PM and CM in a public meeting. He has been booked under various sections, including IPC section 504 (intentional insult with intent to provoke breach of peace).” The police also invoked 125 Representation of the People Act against him, she added. The case was filed on a complaint filed by election flying squad. Two cases against Guddu Pandit was filed at Pinhat police station last week. “In the first case, Guddu Pandit is accused of allegedly using abusive words against former minister and MLA Raja Aridaman Singh, while addressing a public gathering at Pinhat town. Guddu was booked for violation of model code of conduct and under section 504,” said Gyanendra Solanki, station house officer, Pinhat police station. Solanki added, another case against Guddu Pandit was filed for allegedly using hooter on his vehicle and taking out a rally without permission in Pinhat area. The fourth case against Guddu Pandit was filed at Sadar police station on April 9. “Guddu Pandit was booked for allegedly threatening candidates saying he would beat them up in their homes. The case was filed on charges of violation of model code of conduct,” said station house officer, Sadar police station, Kamlesh Singh. Uttar Pradesh Congress Committee head Raj Babbar is contesting from Congress ticket and the BJP has fielded Raj Kumar Chahar from Fatehpur Lok Sabha seat.